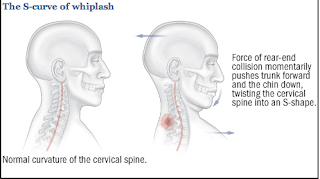 Whiplash of the cervical spine or neck is common among patients who have been involved in rear-end motor vehicle collisions, and also can also affect those who participate in contact sports such as rugby and football, or those who have experienced other physical trauma affecting the neck. The most common cause of whiplash injury happens in response to a rear-end vechicle collision. As such, most studies that have been conducted have simulated a rear-end vehicle collision. During the collision, the spine of the person(s) being hit behave much like a cracking whip in the way that the spine moves in response to the sudden force. At impact, the torso continues to travel forward towards the steering wheel. The chin tucks downward and the skull travels backwards, causing an almost ripple-like motion through the spine, towards the head. That is a lot of different directions for your body to be trying to go all at one time. This movement causes the normal curvature of the cervical spine or neck, which is usually slightly convex to become more concave in shape. The sudden force pushes the spinal vertebrae into a sudden and unnatural alignment. This in turn causes surrounding muscles to tense up to try to stabilize the neck, which can cause muscle strain. The ligaments and discs in the neck can also be affected from the force. 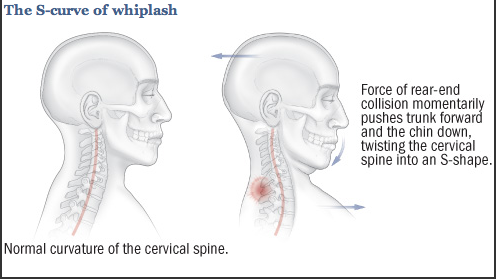 Whiplash injuries are assessed and graded due to the severity of symptoms. Further information regarding severity and the grading scale can be found here on our website. Since whiplash injuries can involve a variety of tissues and can differ greatly from one person to the next based on the exact mechanisms (e.g. amount of force, direction of force, pre-existing conditions, speed of the vehicle or vehicles in question, etc. ), there is no single way to treat a whiplash injury. The best thing you can do is visit your doctor or physiotherapist to assess the injury and work with you to build a treatment plan that is specific to you. We treat many whiplash injuries at Insync Physiotherapy and do accept ICBC claims. We would love to meet you and work with you to get you back to feeling your best.